Those of you who visit this site regularly know that I have very high (some would say nearly impossibly high) standards for adventure strips. I find 90% of them practically unreadable, usually because of simplistic storylines, less than stellar art, or bad pacing. I must confess that for me much of Tarzan's seven plus decades in the newspaper falls into the unreadable category. When the art is good, and it often was, the storylines seldom hold my interest. That can be ascribed partially to Mr. Burroughs' creation itself, as opposed to shortcomings in the handling of the comic strip. The assumption that this white man, given the benefit of growing up in the jungle, naturally becomes the lord of the beasts and the native tribes (if they know what's good for them) is far more apt to make me giggle uncontrollably than to be swept away in the adventure. I have no desire to watch the insanity of manifest destiny and the white man's burden played out in the jungle or anywhere else. It certainly doesn't entertain me. Now before Tarzan fans start screaming for my head, I do understand that there was plenty of lip service to the contrary. You can point out, and rightfully so, that many of the villains in the Tarzan strip are actually white guys, especially as we come into the more enlightened years of race relations. But sorry, to me the ugly writing is always on the wall. And that's why I can say that I was thrilled to hear that IDW was going to reprint the Russ Manning years of Tarzan, as opposed to the earlier stuff. The Manning years come at a time when the jingoistic and paternalistic ideology of Burroughs was reaching a new low ebb. Manning, who also wrote the strip, goes out of his way to tell Tarzan stories that minimize the unsavory aspects of the Tarzan legend, and he even occasionally goes out of his way to point out that Tarzan is more like a governor of the jungle than a lord (both being ridiculous, of course, but hey, its an improvement). I first encountered Manning's Tarzan work in those great 100-Page Super-Spectacular comic books DC comics issued in the early 1970s. 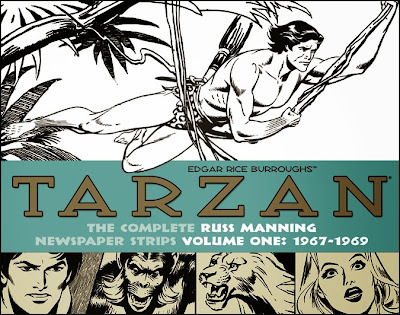 I loved all the oddball (to my young eyes) material in those magazines, and absolutely fell in love with the Manning strips in the Tarzan issues. The art and stories blew me away then, and I'm happy to say that age has not dimmed my enjoyment of these stories, or lessened my admiratiion for Manning's incredible clean line artwork. The only slight caveat, and its a point of interest only, is that I was surprised how obvious it is when Manning occasionally hits a deadline crunch. It is incredible how little it takes for Manning's work to become obviously and painfully inferior in those cases. A few lines in not quite the right place and you have laughably misshapen characters in anatomically impossible poses. But that just goes to show what a tightrope act Manning was attempting with his highly polished art, and how much care he usually devoted to this labor of love. What an artist! In addition to three Sunday color stories and two long daily continuities, we get a delightful and informative foreword and introduction about Manning, telling the story behind the story. As for the reproduction, I don't even really need to mention that anymore, do I? If it is an IDW/Dean Mullaney production you can be assured of unsurpassed quality restoration and reproduction. Now if only Luca/Disney/ESPN would release a complete run of the Manning Star Wars strips.